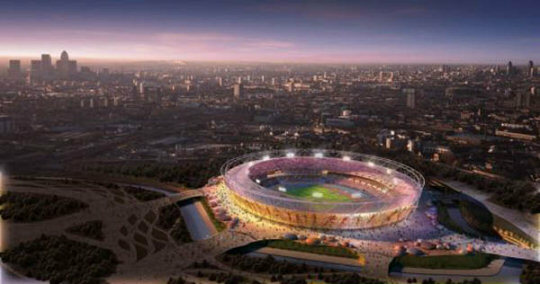 The site for the 2012 London Olympics Stadium. 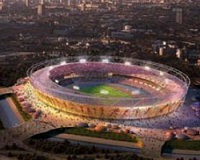 Description: The stadium will cater for 80,000 and after the games will be reduced to 25,000. A roof will stretch around the Stadium to provide cover and support the lighting and sound systems used to stage the Games. It will also provide a base for special effects during the ceremonies. The Stadium will be built to international track and field standards for athletes. At the begining of April, the contractors preparing the site for construction handed over the Olympic Stadium site to Team Stadium, the consortium that was appointed to design and build the Olympic Stadium. The innovative design was unveiled in November 2007 (see image gallery on this page). Team Stadium is now making the final preparations to the area, so it is ready for the start of construction at the end of May - three months earlier than planned. The planning submission for the ground works was approved in March 2008. The second planning submission which details what the Stadium will look like will be submitted in May 2008. All of the existing industrial buildings on the site have been demolished, including warehouses and chemical and metal works.